This is Liam at 1 week old. He is so sweet beyond words. Every time I open my mouth to talk about him or write about him I gush, gush, gush. This is him after a particularly satisfying feeding. Yes, he is breast-feeding like a champ which is a relief. It took some help from the midwives and a lactation consultant but now we are doing so well with it. He's almost back up to his birth weight which was 7 lbs 15 ounces. He lost 10% of his weight before we left the hospital. This is not uncommon apparently. Isn't he beautiful? I can't get over what an amazing baby he is. His needs are easily met and we love him to bits. Malcolm is thrilled and is such an incredible dad. He did all the diaper changes at the hospital, along with feeding and watering me and soothing the baby. I love my husband (and now my boy) so much it is overwhelming. The C-section birth went as well as I could have hoped for. No matter how Liam arrived, it was a momentous event to see him little face for the first time. I certainly would have loved to birth him vaginally if he had been head down. I would have liked that experience. The c-section team was amazing though. That made all the difference. They were calm and respectful and made sure I was comfortable. Also, it was the midwife of our choice that was present for the birth and she was incredible. I was happy that she was there with her good vibes. Malcolm was able to watch Liam being born from me and I saw Liam's head being delivered. It was awesome and amazing. I watched Malcolm's face as he watched Liam being birthed and it was wild. His eyes were wide with amazement and it was like the energy in the room was charged. As soon as I heard Liam cry, I started crying and I was so relieved. He is healthy and he is thriving. I can't get enough of him. I think the hormones from breast-feeding are making me all blissed out all of the time. Which is pretty necessary considering that I feel like I'm feeding Liam all the time. We had such a great night last night and I feel like I finally had a decent sleep. Our post-partum midwifery care has been amazing and I love that they do home visits. I'm not going to pursue confronting the issues that I had with one of the midwife's care. Why bother? Everything is put into perspective right now. I'm healing very well and feeling well. I have to watch that I eat enough because I start feeling really weird when my blood sugar is low. I've been eating tons. We're also trying to take small walks this week so that I start to feel like I can go out on my own. I was such a nervous Nelly when we went out yesterday but maybe that's because Malcolm was holding the baby in our sling and I don't know that I trust the sling. Weird, eh? We may need a different baby carrier. I also have a wrap called a cuddly wrap and it's pretty good. Maybe I'll use that today. We're going to give Liam his first bath today. Malcolm will sit in the tub and I will pass Liam to him. I want to be in the tub but not sure it would be the best idea with my healing wound. I'm excited to share this news and I look forward to blogging about some of our up-coming adventures together. 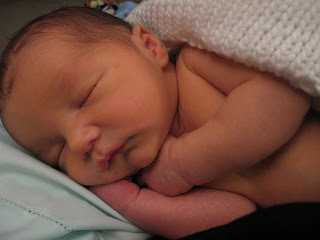 We went in for the midwives' appointment yesterday with L and actually it went really well. I feel okay about her being at the birth if it ends up being her (and I feel like it will be C in the end). So not sure how or why my feelings changed. Maybe I was feeling spooked or something. I don't know. Something came to a head last night and I decided (and Malcolm agreed) that we did not want one of the midwives (L) that we have to be present at the birth. It was looking as if she was going to be the one attending. Oddly, my c-section was booked at a time that was at the very end of her on-call shift. We kind of hinted that maybe it would be better to have the "fresh" midwife (C) who would be at the beginning of her shift. It was left up in the air last week as to who would be attending. As I've gone over it in my mind, I have this really clear feeling that I don't want L at the birth. She doesn't put me at ease and she has not helped me to feel positive and reassured about the c-section. She seemed disappointed in my choice not to have the baby turned and questioned me at length about it. I felt like I was defending and justifying my choices. Instead of asking me if I wanted to talk out how I came to the decision, she questioned me and challenged me as if I was on trial. What the hell? Her bias was so obvious and it was no longer about me or Malcolm or our baby. It was about what she (and her colleague) thought was best. It would have been wonderful to have a supportive climate in which I could have become really clear about what was driving my decision not to turn the baby. Our doctor (OB) asked us today why we decided not to have the version. The best I could explain it was that we had been through so much that I just didn't want any interventions that carried some risk. We wanted this baby born safely. I know that a c-section carries risk so maybe I'm not making sense or being rational. I think that my decision was also made at the gut level - I had tried so many things to get this baby to turn and he/whe wasn't budging. To try and force the baby to turn seemed intuitively wrong. So I called the receptionist at the midwives' office and explained how I was feeling and asked her what she recommended that I do. She told me that I needed to talk it out with them. So, in an effort to avoid that (because frankly, I don't want to invest the emotional energy) I asked if she could try and confirm who would be at the birth - L or C. She agreed that she would do that and get back to me. So I heard from her at the end of today and she said that it would be C unless there was another client in labour and then C would have to be with her and L would be with me. The receptionist thought that there was a good chance that it would be C because many of their clients had given birth recently. So, it's still a bit up in the air. I have an appointment tomorrow with L again (don't know how it ended up being L again) and I tried to change it but C was not in for clinic hours (not sure why). And now I'm left with the decision about whether to keep quiet or whether to confront L. I think we've decided that we're going to go with the flow. Malcolm and I both figure that she will be in the periphery of the experience and it will really be all about us and welcoming our new baby. That feels right in this moment at least. We'll see if that changes. I don't want any drama before the baby's birth and really, all of the midwives we've seen have cared a lot and that's pretty important. I think one of the pros of having an elective c-section is that there is time to plan, and one of the cons of an elective is that there is time to over-think things. I'm going to try and meditate and pray in the next few days so that I will feel centered and ready for this incredible life event. Sleeping all the time these days it feels like. I am having a hard time getting comfortable at all. I do like swimming, it helps to alleviate the discomfort. I ought to go out for a walk today but I am enjoying being lazy. I did stay up late last night and I just wanted a pj day today. I'm getting more comfortable with the idea of a c-section. I shouldn't romanticize labour because I'm sure that it could be traumatizing too. It's funny though how I feel like I'm missing out on a universal experience but that's a stupid idea, it's not universal for all women. A bunch of women I know are not even having children for a variety of reasons. I guess I ought to be getting used to these surprise circumstances. There I go, going to that place of self-pity. I don't want to take things for granted. I have a lot to be thankful for and I want to focus on that. I am so glad that I don't have to work right up to my due date. I would be a mess. I think that I'll go back and read some of my posts since the beginning of this pregnancy. I have been reading over my journals and it's interesting to look back over the whole time. I've been incredibly happy and worried at times. For the most part, I've really enjoyed this pregnancy. I've enjoyed being pregnant. I am going to enjoy being a mom and caring for a little person. I am so in awe that I will get to meet him or her soon.